Our Board & Train Programs are based on utilizing our Pack to bring your dog back to the core of being a dog. 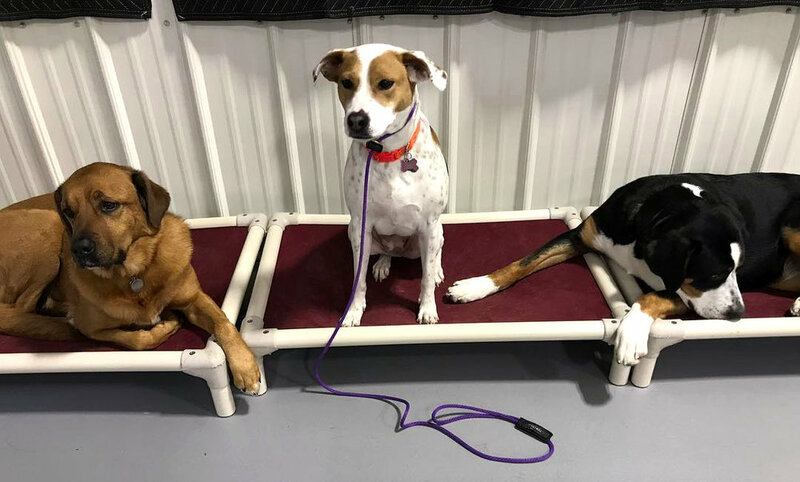 Our Pack consists of regular Daycare, Boarding, and Staff dogs. Dogs are very social animals so it is essential to incorporate your dog in and around the pack on a daily basis. Skilled dogs are the best teachers when it comes to educating, and our environment is a great setting for your dog to learn. The Pack is supervised during the day to help create good behaviors and address the unwanted behaviors while keeping the environment safe for everyone. When your dog is here for training they will be with the Pack or working one-on-one with a trainer who is addressing your specific goals. Our programs are customized to build a foundation to change behaviors at home. Call us 802-851-8375 for more information and answer any questions you may have. ——> Stay Tuned for more information on our new Board & Train Programs!!!!! We are currently updating the information on our website. Please call us for more information on New Board & Train programs for Socialization and our new Courteous Canines Board & Train Program!